Republica Havas also wins ¡BRAVO! Multicultural Campaign of the Year Award for Toyota, and Fashion/Beauty Campaign of the Year Award for European Wax Center. 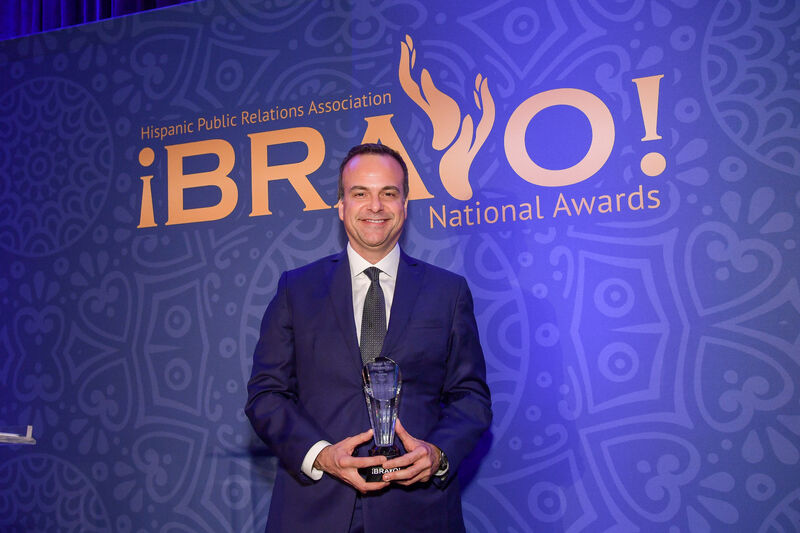 Jorge A. Plasencia, co-founder, chairman and CEO of Republica Havas, was recognized by the Hispanic Public Relations Association’s (HPRA) with its 2018 ¡BRAVO! Pioneer of the Year Award. The HPRA National ¡BRAVO! Awards are one to the most prestigious awards in U.S. Hispanic communications and marketing. The sold-out gala event was held at the Lotte Palace Hotel in New York City. “I stand on the shoulders of the legendary women and men who came before me and I dedicate this significant award to them for paving the way,” said Jorge A. Plasencia, co-founder, chairman and CEO of Republica Havas.“My thanks to HPRA for selecting me and my gratitude to each and every person who has helped shape me in this incredible industry,” he added. Plasencia has had a storied trajectory in media, sports, music, entertainment and marketing. He has been recipient of numerous awards and honors throughout his career, including CEO of the Year by the Greater Miami Chamber of Commerce, Ernst & Young Entrepreneur of the Year, and Humanitarian of the Year by the March of Dimes. “HPRA is proud to celebrate individuals whose work revolutionizes the future of our industry,” said Veronica Potes, president of HPRA. “Congratulations to Jorge on his extraordinary achievements and for his continuous efforts that have influenced the next generation of communication leaders,” added Potes. 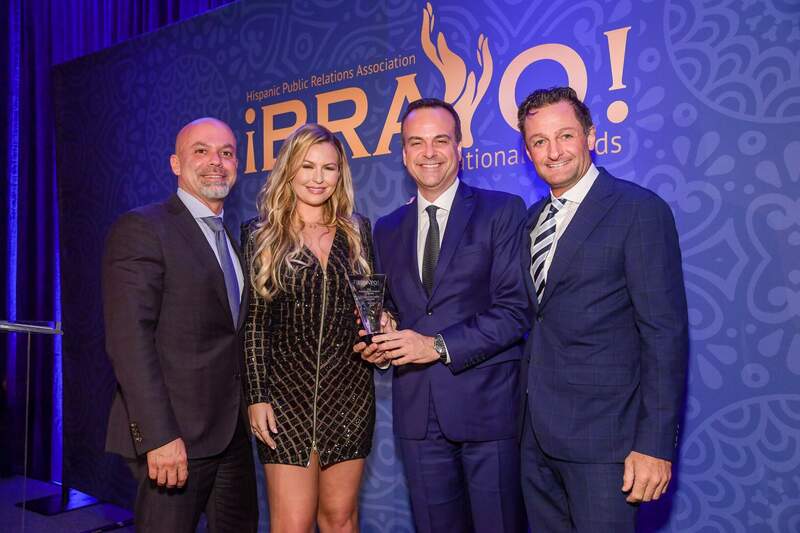 Ilia Calderon, co-anchor of Univision News, was honored alongside Plasencia with the HPRA ¡BRAVO! Journalist of the Year Award. Republica Havas is one of America’s leading and fastest-growing multicultural advertising and communications agencies. Through its “Rethink Relevant” strategic mantra, Republica Havas provides integrated services including strategy, creative, research, media planning and buying, analytics and consumer science, digital, public relations, social, and experiential to numerous blue-chip clients in the U.S. and markets around the world. Founded in 2006 and based in Miami, Florida, Republica Havas is part of Havas Creative North America. For more information, visit republicahavas.com, and follow @RepublicaHavas and #RethinkRelevant on social media. 2019 © Republica Havas, LLC. All rights reserved. When we set out on this journey on November 13, 2006, we had no idea what was ahead of us. We were two (younger) guys with a drive to build something great. Early on, with the help of our team members, we carefully crafted the 14 Principles that have guided Republica these 4,322 days. And what a ride it has been! We’ve enjoyed great triumphs and experienced heart-aching loss. We’ve been fiercely entrepreneurial and nimble and have always made an effort to give back to the community. We’ve grown, evolved, and learned from many mistakes along the way. Our clients have been incredible. They’ve been our partners on this journey. We’ve accomplished so much with them and for them. They’ve allowed us to do groundbreaking work, and we’ve been so proud when that work has received national or global industry accolades. We are so grateful that they have chosen us. And then there’s our team. The Republica family. Together, we’ve shared so much, including thousands of cafecitos. Many of us have been together through thick and thin for years. And others have joined us more recently. Everyone is part of the story. Now, the story evolves. The family grows. We’ve been approached over the years by potential suitors; including holding companies and private equity firms. We would always listen, but it never felt right. We knew that if and when we were to consider some sort of alliance it would have to be on the right terms, with the right people. We knew we would only want a partner that would allow us to keep doing what we love, yet give us a global platform to grow and scale. Maintaining our independence, our team, and our secret sauce, our familial culture, have always been paramount. We’re beyond excited to inform you that we feel we have found that partner. We will be joining forces with one of the world’s top marketing and communications companies, Havas. As part of this new venture, we become Havas’ lead multicultural agency partner in the United States. You may ask why, or why now? The answer is simple. Why not. We recently reached our pinnacle, something we’d worked hard to achieve for years. We’re now Ad Age’s number one independent U.S. multicultural agency. Albeit a fantastic milestone, we can’t rest on our laurels. As our industry experiences the most significant disruption of our lifetime, we believe that joining forces now with Havas makes perfect sense. Havas is a global, transformational leader in creative, media, data and analytics. And its parent company, Vivendi, founded in 1835 in Paris, is one of the world’s leading media and entertainment conglomerates, also owning Universal Music Group, France’s Canal +, and Gameloft, among other major assets. We thought long and hard about this decision. One of the factors we’re most excited about is the new growth opportunities and many expanded benefits we’ll now be able to offer our employees. In closing, so many people deserve our gratitude today...our families, our friends and clients, and each individual that contributed in small and big ways to this dream. You know who you are and we thank you all. And lastly, our name. We will be known to the world as Republica Havas. We’re now part of this greater family, and we’re so excited to begin this new chapter of our journey, together. We collect information from you when you apply for a position on our Careers or Internships form or when you provide your information on our Subscribe function. When submitting information using these forms, as appropriate, you may be asked to enter your: name, e-mail address, company, mailing address or phone number. You may, however, visit our site anonymously. 1We strive to be authentic in everything we do. 2Losing money is easy to turn around, losing our reputation isn’t. We guard it above all else. 3We believe in talent. Talent is our key to success. 4We want our talent to excel and develop to their fullest potential. So we help Republica Havas' employees and partners forge a path to the success that they desire. 5Our talent is compensated for the value they generate, not just the hours they work. We want our clients to compensate us this way too. 6We believe in a team approach to our work. Dedicated client teams are at the core of our business. 7We value people who accept responsibility and mean it when they say: “The Buck Stops Here.” We feel that our clients need to live by this philosophy as well. 8We’re transparent and have nothing to hide. We act ethically and are loyal to each other and to our clients. 9We understand that we’re not right for every client. We will resist the temptation to work for everyone and will only choose clients that inspire us. 10Republica Havas focuses on creating value for clients with every move we make, every job we take. 11We believe in Great Work, Great People and Great Clients, which will naturally result in Great Growth. But we don’t pursue Growth by itself because it usually won’t result in Great Work, Great People and Great Clients. 12We will be compensated fairly for the value we provide and say no to unreasonable expectations. We’d rather turn down work than take on something that we can’t deliver at the highest level. 13Speaking of great work, we like the fun, exciting and fulfilling kind. 14Above All, somos familia. We believe in family, our own families and our Republica Havas family. Everyone contributes to the vision, goals and purpose of Republica Havas because this is the purpose of it all: To create something great and share it with the people we love. In 2006, Jorge A. Plasencia and Luis Casamayor noisily occupied the corner booth at a Miami eatery as they hashed out plans to build a new kind of agency. It was the same year Twitter launched and that Facebook was starting to reach the masses. Countless espresso-fueled conversations and strategy sessions had culminated into an important narrative: there was a seismic multicultural and digital shift taking place, and most agencies weren't addressing it. They founded Republica in November 2006, and within a few short years, with a growing roster of blue-chip clients and garnering industry acclaim, it became one of America’s fastest-growing independent agencies. Fast forward to July 2018, when Republica achieved the milestone of ranking as Ad Age's No. 1 independent U.S. multicultural agency. Subsequently, in September 2018, Republica announced it had joined forces with Paris-based Havas Group. Havas is part of Vivendi, with numerous assets, including Universal Music Group, Gameloft and France's Canal+. Renamed Republica Havas, the Miami-based agency serves as the global conglomerate's lead multicultural agency partner. Many of the world’s top brands trust Republica Havas as their partner to connect with the most culturally diverse, technologically-advanced consumer base in history. Built on a familial culture of caring for the community, Republica Havas continues to be recognized by client partners and the industry as a nimble, effective agency with a reputation for delivering groundbreaking, award-winning work.